Quilting sewing machines is all about using the best tools to help you on your way. I am often struck by just how expensive quilting can be. Buying sewing machines is the biggest single expense. You might be tempted to cut corners with your budget as well as snipping off those corners to turn a piece! Let me persuade you that this is not a good idea. Yes, any sewing machine can do straight stitch. 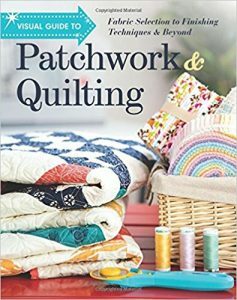 Technically that is all you need for quilting, so why not buy the cheapest machine you can afford? Cheaper machines tend to not be able to cope with the demands of quilting. I had a Singer Confidence when I started and because I sewed infrequently, it lasted 7 years. When I started stitching more, it had problems. It did give me the confidence to sew. Sadly Singer machines are not what they used to be. I will never buy another. I upgraded to a Brother and the difference is amazing. Sadly we cannot all afford a Bernina. 2. Throat space – this was the reason I upgraded – fitting that full-size quilt into the throat space of a cheap end machine is going to cause problems – we will look more at this next week. 3. 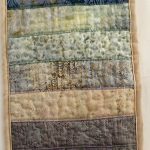 Durability – a cheap machine is just not designed to take the tear and wear of daily quilting. Price is the main factor for many of us when choosing sewing machines. It is the reason why I chose the Singer Confidence. The 7470 at around 300 gbp seemed enough to pay to learn the basics of quilting and do my dressmaking. If it had not had technical problems with the computer side of things, I might still be using it. However, putting my first full size quilt through it was a nightmare. So I was almost relieved when it broke down. A. Test drive it. Buy from a reputable sewing machine specialist – speak to them, get a demonstration and try out the machine. 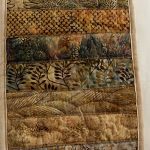 Take a quilting sandwich and see how the machine handles the layers, not a single fabric. B. Most manufacturers run offers from time to time, especially when a new model is coming out – you might get a bargain price on the older model. I saved 300 pounds and got a bundle of accessories as well as an extra accessory and the store had a bonus offer too, worth a total of over 120 pounds. C. I would avoid online retailers for the most part. My machine was under guarantee, but the online retailer would not honour it. D. If you do not have a sewing machine specialist retailer near you, many manufacturers have machines at exhibitions for you to see and try. E. Talk to friends – what do they use? What do they really think about their machine? F. Decide how often you sew, if you also want to embroider and choose a suitable machine. G. Look for bargains on gumtree/ebay – people who have bought an expensive machine and decided it is not for them. 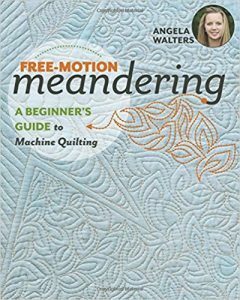 What is a quilting machine? In general a quilting machine has a wider throat space, comes with feet that a dressmaking machine does not and has features that the latter does not. Usually it will have a better auto feed system. Quilting machines tend to be more expensive but the features are worthwhile. All domestic machines are intended for occasional use. None are guaranteed for use by a business. Consider an industrial machine – they are intended for daily use. Unfortunately, you’ll see the words ‘heavy duty’ on cheap machines. Juki are reliable and sturdy but tend to be straight stitch machines only. A longarm is probably most quilter’s dream machine for quilting full-size quilts. They take a lot of space and start at around 6,000 gbp. 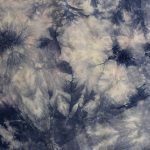 Many reputable sewing machine retailers can offer finance, spreading the cost of buying your machine. Always check the small print. 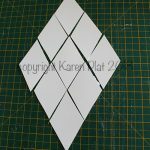 In this tutorial, I will teach you how to cut your own diamond templates for quilting. Many templates are too difficult to make yourself, but diamonds are a breeze. This is an easy free tutorial to enable you to make templates quickly and without too much expense. 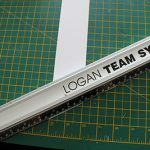 For accuracy I use a cutting mat and a rotary cutter, with a solid steel ruler. My ruler is non-slip and perfect for the job. I usually use thin card. 1. Place your card on the cutting mat, lining it up so that it is straight. 2. Place your ruler along the 60° angle line. 3. 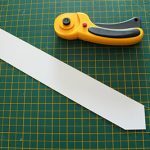 Cut the width of the ruler. This ruler is 5cm (2″) wide. It produces a 9-patch diamond that is 15cm (6″) across when stitched together with the quarter inch seams added. You can use a narrower ruler for a smaller diamond. 4. Take your card strip and place the ruler aligned with the straight edge. 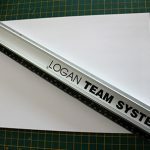 Cut the width of your ruler. You have one diamond. Repeat to make more, using as much of the card as you can. 5. Place the card face down on the reverse of the fabric. 6. Allowing a quarter inch seam, cut around the card. 7. 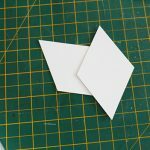 Although your card template needs to be accurate, when cutting fabric, you can cheat a little, as long as there is enough fabric to fold over and you can secure your seam. 8. Whip stitch diamonds together with right sides facing. Words, work and images copyright Karen Platt. This tutorial is for your own personal use ONLY and is not to be copied nor distributed by any means without written permission from the author. My current textiles work in progress and finished work. Just a quick pictorial update on what I have been making so far this month. 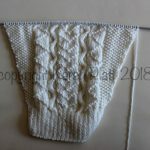 I have knitted the back and half a sleeve of a wool sweater I have designed. It is my signature textured style. I am undoubtedly in love with cables. The knitting pattern will be available shortly. The rest of my textiles work was all quilting. 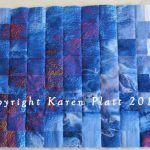 I made a crazy quilted picture. I have decided I like it the other way round, but it was designed this way to fit a frame, so this way it will stay! I added embellishments and it will have a narrow ribbon border so that it fits the mount. 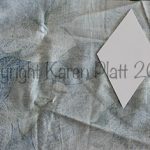 Easy enough to do – draw the mount size on paper or fusible wadding/interfacing/web and add half inch all round. This is your design space. Add fabrics as desired and stitch in place.For this piece I worked without any kind of interfacing and added fabrics one by one. 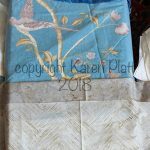 I am also working on a new oranges and lemons quilt, but have not photographed yet. Just finished the cutting stage. Today I started making fabric decisions for a new quilt to be mounted onto a canvas box frame. I was going for blue but changed my mind and I know just what fabric is missing now. Thank heavens for stash. 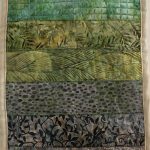 In the evenings, I continue to work on my hand stitched calico quilt. One border is finished and the quilt is now sashed. Plenty of sore fingers there. 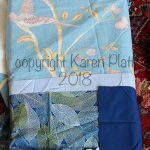 These finished textiles quilt designs and more will be on my Festival of Quilts Stand C5 8-12 August 2018. See you there. Yes, textiles design often looks as messy as that pile of fabric 🙂 I do stash neatly, honest! 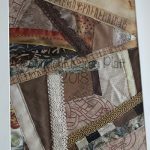 Quilting With Photos is not a difficult process if you know how. 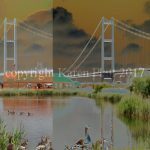 Like many things it looks complicated, but if you follow these simple steps, you will have success with printing your own photos for quilting. First of all you need to understand the basics. If you get the combination wrong, then you will have problems. 1. Printer. Look at the printers available and ask the seller if it is the right printer for you. Most people would choose a Canon or Epsom. Things to ask include – does it print on fabric – do I need to do anything special? 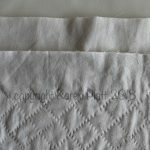 Will it take fabric on a roll or just sheets? Think about the size – will you be happy printing just A4 or do you need an A3 printer. Ask if you can see print outs. 2. Ink. You need an inkjet printer not a laser printer. There are two types of inkjet – some use pigment based and others use dye based. This is a very confusing area or printing on fabric, especially because most applications are for paper. On paper pigment ink is much preferred because it is fade resist. Dye based are usually brighter colours. The latter cause problems on fabric because the colour washes out or bleeds (runs), which is not what you want on fabric. You cannot switch inks in your printer, if you have bought a dye-based printer, you must use dye-based inks. If using these on fabric, you need to prepare fabric beforehand and after to help the dye fix. 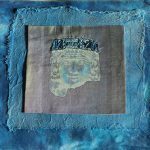 If using pigment-based inks, use pre-treated fabric for best results. Either way printing on fabric is more suitable for projects that do not need washing regularly, they will fade. Always use the inks recommended for your printer by the manufacturer and not cheap substitutes. 3. You can cut fabric, attach it to freezer paper and run it through your printer. You can be lucky with this many times, but sooner or later it usually jams your printer and hey ho, you wish you had not. Computer fabric is not excessively expensive and saves you the problem of sorting out a jammed printer and also saves you time. 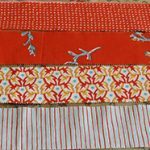 You can buy different fabrics such as cotton, linen and silk. 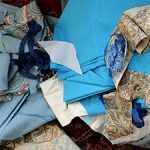 If you want to know more about what to print on fabric and how to create your own designs, then see our ecourse or why not have a go at designing your own fabric and printing it, here in our ecourse. 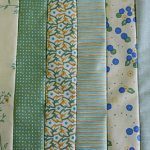 In an ideal world, we would use a large-format printer to print out quilting fabric, but these come at a cost and the average person would never get their money back. For the past ten years, bureaus have been springing up offering to print your fabric. You can even order fat quarters from some of them as well as metres. 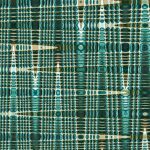 They produce fabric digitally and you can sell your own designs. Just what the doctor ordered – colourful knits – a joy to wear and a pleasure to knit. Combine colour to make your life a happier place. 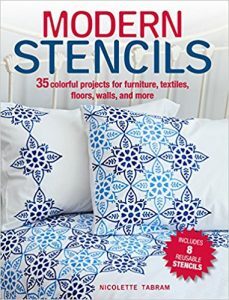 This book includes projects for the the home and accessories to wear. There are 20 projects including bags, hat, cardigan, sweater, tank top, shawl, cowl (front cover image) and scarf. The clothes are basic designs. For babies and children there is a cardigan, sweater, two blankets, a rabbit and hat. Under home and gifts you’ll find gorgeous mittens, cushion, passport cover (could be adapted to a phone cover), a fair-isle bag knitted using a chart, a tie, leg warmers, and sweet embroidered purse that could double as a pencil holder. At the back of the book is a useful, illustrated techniques and finishing section covering the basics. 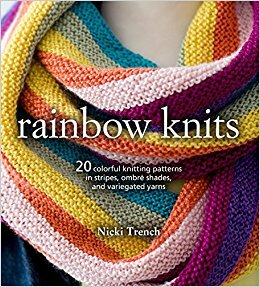 Try your knitting skills working in stripes, or use ombre or variegated yarns. 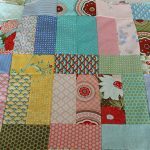 You have by now, if you are following the blog, read the quilting guide, bought your basic tool kit, got a little sewing machine and some fabric and you are ready to start. Yet you keep putting it off. You are not sure you understand the instructions, have chosen the right fabric or even the right pattern. Let me help. 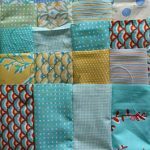 Last week we looked at simplifying quilting for beginners so that you can complete a quilt. Once you do so, you will gain confidence. I know how difficult it is to start, it took me years of indecision. 1. Find a quiet time to begin. 3. Make sure you have a comfortable chair and that it is the right height. 4. Have everything to hand that you need. 4. Breathe deep and relax. 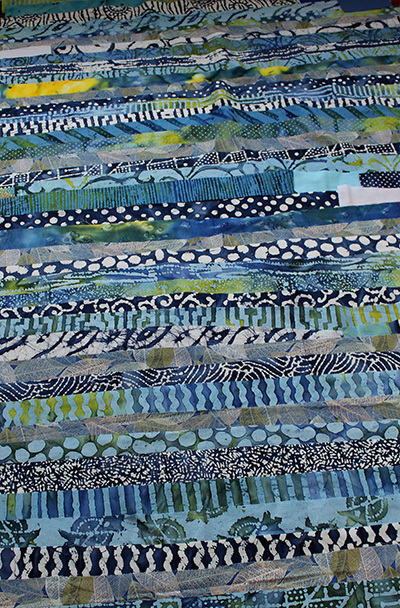 Try to set a time to quilt each day even if it is only 30 minutes. Anything to get started. Even if you are just sewing one seam, it is a start. Once you start, your confidence will grow. Only you know your ability. Aim for something simple such as strips, squares or geometric shapes such as squares and oblongs. Leave the triangles for now. 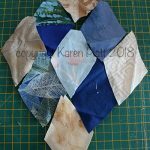 English paper piecing if you prefer hand stitching, is also amazingly easy and very accurate. 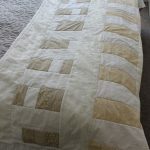 Start with a small project to gain confidence and you’ll soon be on the road to full-size quilting if that is your aim. Build with each project you make. Practising on small projects means that you will finish them quickly and once you have finished projects your confidence just blooms. When you are confident of one step, move onto the next. If you need practice with straight stitch and quarter inch seams, then practice. 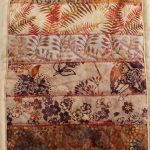 Make strips into small bags or journal covers. What it is best not to do is to start a quilt above your skill level and be unable to finish it. So forget that dream quilt for now, and concentrate on finishing simple projects. Your time will come to make the quilts of your dreams. 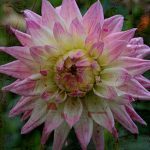 Made a mistake – get out your unpicking tool and start again. Or try again the next day if you are out of patience. Practice and finished projects equals progress.